The 14-foot steel gates closed behind us in the early morning light before we grasped which of the several locking methods was required. In a few moments we had fore and aft lines around a steel cable, recessed in the lock wall. The waters rushed to lift us beyond the tidal flows of the Hudson River. 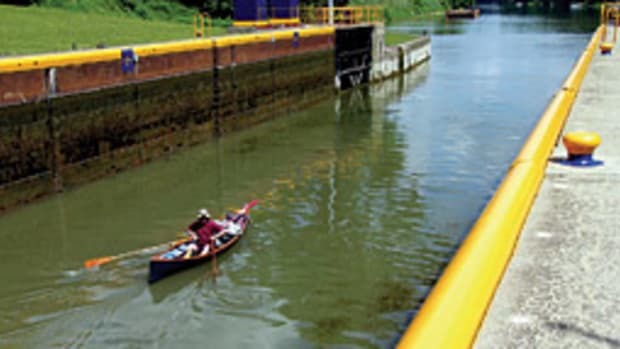 At this first lock near Albany, our cruise to Montreal began in earnest. Three days earlier I had begun a monthlong cruise up the Hudson River to its deepwater head of navigation at Albany, then west on the Erie Canal section of the New York Barge Canal, into Lake Ontario. From the lake we would follow the St. Lawrence northeast past Montreal. Then we would turn south by the Richelieu River and canals to Lake Champlain, its canal, and again into the Hudson. Aboard our 30-foot sailboat, a 1981 Catalina 30 named Bluebird, I begin the cruise with some sailing buddies with an evening sail to Willets Point, near the Throg’s Neck Bridge. My family was to join me later. We anchored past midnight to wait for a fair tide at 6:30 a.m. That tide would pull us quickly through the Hell Gate and deliver us before Gracie Mansion to complete a left turn at 86th Street. The ruins at the end of Roosevelt Island stand in startling contrast to the crowded luxury of the Upper East Side of Manhattan across the East River, which is always thrilling. We loitered in New York Bay for two hours waiting for the tide up the Hudson to run fair. There was time to admire Lady Liberty and Ellis Island from the edge of the line of security buoys around each. We took ice and hot coffee at Liberty Landing Marina, then began a 12-hour ride with the tide to Poughkeepsie. Leaving the Highlands, the widening view before us speaks to an earlier time of forest and farms. Parks have preserved much of the Palisades of the western shore thus far. With these parks, the robber barons of the Gilded Age saved the stone facade of the Palisades from being quarried to build the homes of a booming New York City. We anchor by Poughkeepsie at last light outside a buoy marking the channel. For me, the day has been the richer recalling James Fenimore Cooper’s “The Spy” traversing the Highlands between Loyalist and American at the height of the Revolutionary War activity on the Hudson. I wonder which mountain summit held the mysterious hut of Washington’s spy? The end of June should have given us a following breeze, but what little we have is on the nose. The next day is a short run to Catskill where the well-recommended Riverview Marina unsteps and secures the mast. With its deck-stepped mast, our Cat 30 is well suited to the unstepping and stepping between canal systems. Catskill is mile 107 of the 148 miles from the Battery to the Federal Lock at Troy, just beyond Albany. It has been a good weekend on the water from Friday evening. My wife and our daughters replace the transit crew of longtime sailing buddies. On board now are my wife, Tina, with Katherine, 10, and Elizabeth, 12. As a family, Bluebird sets out in the late afternoon of an oppressively hot, still day. We follow the tide three hours to Coeyman’s Landing for dinner and an evening tie-up. Local mariners returning to their boats from dinner make room for us. Their easy courtesy tells us that we have escaped our New York City orbit. We spend the day going up 150 feet in the five locks of the Waterford flight, effectively crossing the Appalachian Mountains on the Erie Canal. As the water rises in the last of these locks we are able to look back and marvel at the height we have risen. Somewhere in the flight, a lockmaster sold us a pass for the New York State Barge Canals. Our first stop is the Schenectady Yacht Club. Ever since Catskill we have been paying a third of the cost of overnight dock space elsewhere in the Northeast. That economy holds for the whole cruise. Nearly every lock has free overnight mooring space and many have park-like facilities, which we enjoyed other nights. At more towns than we could think of stopping, there are overnight municipal facilities for boaters — usually free. The canal economy is not what it was 40-some years ago when the St. Lawrence Seaway opened and the canal largely ceased commercial operation. The New York Thruway and the railroad corridor follow the canal, leaving it today largely to pleasure boats. We are traveling the waterway that opened the West. As with the interstate highways of today, the Erie Canal had the effect of creating a ribbon of industrial development along its Mohawk River path. Not only did the canal slash freight rates for the products of interior New York, but it went on to bypass Niagara Falls connecting New York City to Lake Erie. From Lake Erie there is uninterrupted deep-water navigation to Chicago. The original 4-foot-deep canal of 1825 was replaced by 1862 with a 7-foot-deep canal. The current New York Barge Canal was completed in 1918. Aqueducts remain where the earlier two canals crisscrossed the Mohawk. The ageless stone arches give a European flare to the scenery. In Schoharie and Florida there are interesting parks easily reached on foot (bicycles are nice for Florida). These parks are well worth an hour or two layover. The “Cruising Guide to the New York State Canal System” from the NYS Canal Corporation (www.canals.state.ny.us) easily identifies these parks and many other sites along the route. More navigation oriented information is provided by Richardsons’ chartbooks. The “Cruising Guide to the Hudson River, Lake Champlain and the St. Lawrence River” by Alan and Susan McKibben is invaluable. These references are readily available from major boating stores. Of all the towns to visit, Little Falls, N.Y., seemed the most enticing, and we were well rewarded. Here the canal is near its highest altitude. Emerging from Lock 17, the canal way clings to a cliffside. A public dock on the opposite bank offers a short walk to welcoming restaurants, and a wonderful collection of antique and local product booths in a converted factory building. Not far past Little Falls, the lockmaster at 19 suggested we overnight at Lock 20 where the park had 30-amp power and a tie-up to fill water tanks. Not only was this a comfortable overnight, but there is a long bike path for some needed exercise. Throughout the system, the lockmasters were very helpful. Another day brought us to the eastern end of Oneida Lake where we docked at Skinners Marina rather than the public bulkhead, jammed with Saturday-evening revelers. We made an early start to cross the lake before the afternoon chop, and crossed a mirror of water. Crossing Oneida so early put us in Oswego, N.Y., on Lake Ontario where we could easily re-supply, enjoy good restaurants and overnight in a fine marina. In the morning we would be a sailboat again. Stepping and unstepping the mast all but requires we overnight at the marina. Work starts first thing in the morning. While two crewmembers help with the gin pole crane work, that half-hour is a small part of bending on sails, tuning the rig, perhaps mounting or stowing the crosstrees to hold the unstepped mast. Last, the bicycles and inflatable must be made fast for whatever the lake may offer. By now, lunch is near if not past. The rhythm of a cruise sets in again as the navigator says it won’t be much fun to make Kingston at night, so a spot in Henderson Bay, N.Y., looks good. Henderson Bay is a preview of the Thousand Islands. We enjoyed a lovely sail across the arc of Ontario islands to Kingston. At Kingston we cleared Canadian Immigration and Customs by phone — hard to believe that a few questions by phone will suffice to cross a border, but we were the more comfortable for having our passports and ship’s papers in order. At Kingston, decisions must be made. One can take the Rideau Canal to the north. Or one can choose the Canadian or American channels entering the St. Lawrence. The American Channel is the ship channel; the Canadian Channel is the heart of the Thousand Islands. Staying in the Canadian Channel was an easy choice. There is plenty of water, though a few narrow spots and some fast water call for careful navigation. Kingston is a fine destination. The town is well restored to its glory days as a key fort defending the river. Restaurants cater to every taste. The boater is readily accommodated. The attractions of the town are within easy walking distance, as are a grocery store and the S&R department store. The longest line in town is at White Mountain Ice Cream, surely a contender for the world’s best ice cream. The Marine Museum of the Great Lakes remembers earlier generations on the water and gives way along the shore westward to a pleasant and extensive shoreside park. In the early 1960s the St. Lawrence water was the clean and clear water of the north country. It is again. When I saw the river in the late 1970s it was bright green with algae and weeds to the surface in 10 feet of water. It is a delight to see the water once again clean and inviting, though an anchor will harvest some weeds. The Thousand Islands stretch 50 miles from Kingston to Brockville, Ontario. There are many parks in the United States and Canada with differing arrangements for boaters and campers. In Kingston we found a cruising guide for the St. Lawrence, the invaluable “Ports Cruising Guide to Lake Ontario and the Thousand Islands” (www.portsbooks.com). This Canadian Guide covers the river from Kingston to Montreal. With the Ports guide and the Richardson chartbook, we loitered four nights in the Thousand Islands, moving each afternoon to explore a different island a few miles along. The Canadian channel joins the American at Alexandria Bay, N.Y. Not much further along, the islands end at Brockville, where we spent the night. From there two days and seven large locks of the St. Lawrence Seaway took us along a stretch of this broad river, which reminded us of the Intracoastal Waterway, but with 27-foot depth. Unlike the canals there is no 10-knot speed limit on the St. Lawrence. Our 6 knots was no match for the powerboats, but the sailing was blissful with the prevailing southwest wind and the northeast course of the river. The current, occasionally 3 or 4 knots, was welcome. We made Montreal in two days. Richard Marsh is a longtime Connecticut sailor and USCG licensed master. Part 2 of his family voyage will appear in the November issue of Soundings.